Ian Dickie have recently developed the new DrainRat, a highly portable drain jetter that easily clears clogged drains of grease, sand, sludge etc, using high pressure water. 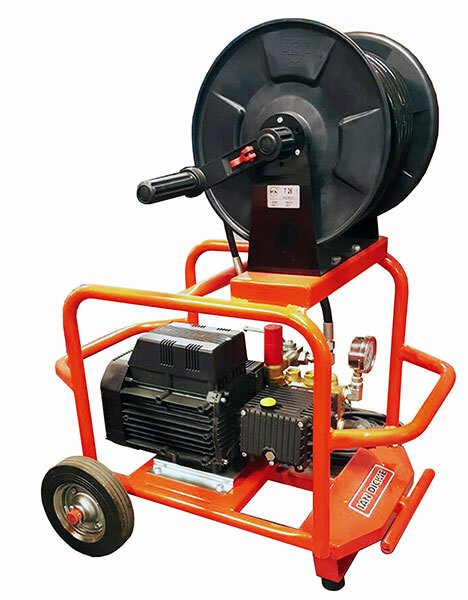 The DrainRat is ideally suited for drain and pipe cleaning in difficult to access areas and because it is driven by a single phase electric motor, it is particularly effective for indoor use, i.e hotels, restaurants, shopping centres, hospitals etc, as there are no exhaust emissions or noise pollution often associated with similar machines. The DrainRat is suitable for cleaning lines from 40mm to 110mm and offers 130 Barpressure with a flow of 10L/min. ideal for work inside buildings, hotels, hospitals etc.